WILKES-BARRE — With two games left in the season, the King's College football team will make its final road trip of the year on Saturday when the Monarchs travel to Annville to face Middle Atlantic Conference rival Lebanon Valley College at 1:00 p.m. in Arnold Stadium. King's enters the game with a 3-5 overall record while standing 3-4 in the MAC after a 38-28 loss to MAC co-leader Albright College on Saturday. Lebanon Valley, meanwhile, stands at 4-4 and 4-3 after falling to MAC co-leader Delaware Valley on the road 28-21. Monarch mentor Jeff Knarr is in his sixth season at King's and owns a 17-41 career record. Lebanon Valley coach Jim Monos is in his 22nd season and is currently 108-121-2 with the Flying Dutchmen. The Monarchs are hoping to build on the positives which came out of the loss to Albright, despite throwing four interceptions which led directly to 24 points, including two pick-six plays for the Lions. King's outgained Albright 344-238 in total yards; led 22-to-15 in first downs; ran 69 plays compared to 49 for Albright, and also held a 34:51-to-25:09 possession time advantage. This against a team with a 7-1 record and is currently ranked 20th nationally in Division III. The Monarchs are ranked fifth in the MAC in total offense with 347.1 yards per-game. King's sixth in passing at 183.3 yards through the air while ranking eighth in rushing at 101.9 yards on the ground. Against Lebanon Valley, the Monarch offense will need to play a much cleaner game and avoid costly turnovers. Running the King's offensive attack is senior quarterbackTom Hehre who played well against Albright beyond throwing three interceptions. Hehre was 14-of-20 through the air but tossed three costly interceptions and was pulled at halftime. For the year he has completed 125-of-212 passes for 1,088 yards with five touchdowns and 10 interceptions. He has also rushed for 190 yards on 64 attempts with five scores. Freshman tailback Gabe Brown leads the ground game with 371 yards on 107 carries and has four touchdowns. Junior Zack Funk adds 255 yards on 55 carries with three scores. 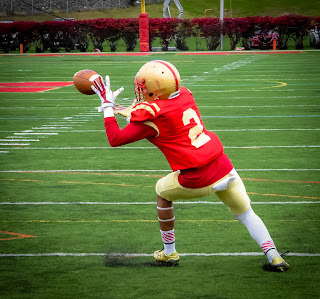 Leading the receivers is junior Mike Palmer who has a team-high 47 catches for 529 yards with five touchdowns and comes off a career-high 112 receptions against Albright. Sophomore receiver Matt Demarco follows with 34 receptions for 327 yards and one touchdown. Sophomore Marquis Miller has tallied 26 catches for 193 yards and two touchdown. Defensively, King's defense ranks fifth in the MAC in allowing 347.1 total yards. The Monarchs are second against the pass in yielding 167.5 yards while standing eighth against the run in allowing 179.6 yards each contest. Leading the King's defense is do-it-all junior linebacker Bobby Russell who leads the team and is ranked seventh in the MAC with 56 tackles, including 4.5 tackles for loss, 2.5 sacks, three forced fumbles, two fumble recoveries, seven pass breakups, and one blocked field goal. Senior defensive end Michael Martina follows with 48 tackles with 10.0 tackles for loss, 7.5 sacks, and two forced fumbles. Sophomore safety Jake Manetti adds 44 tackles with two interceptions while senior safety Anthony Martuccio contributes 42 tackles with two interceptions and two forced fumbles. Senior Chad Curtice has registered 28 tackles with 5.0 tackles for loss and two sacks. Sophomore linebacker Hassan Maxwell chips in with 27 tackles with 2.5 tackles for loss. Lebanon Valley is ranked second in MAC scoring at 33.9 points per-game and are third with 390.1 total yards each contest. Traditionally one of the most potent running teams in the MAC, the Flying Dutchmen rank second in the league with 245.8 yards on the ground while standing eighth in passing at 144.4 yards through the air. Sophomore tailback Brandon Irving tops the MAC with 974 rushing yards, averaging 121.8 yards per-game. Sophomore quarterback Tim Pirrone has completed 58-of-106 passes for 774 yards with 10 touchdowns and just three interceptions. Sophomore wide receiver Travis Saylor has a team-high 23 catches for 349 yards and three touchdowns. Defensively, the Dutchmen defense is fifth in the MAC in allowing 23.8 points per-game. The LVC defense ranks sixth in the MAC in allowing 379.0 total yards per-game. The Lebanon Valley rushing defense is ranked sixth in the conference in yielding 161.0 yards per-game while standing eighth in the against the pass in allowing 218.0 yards every contest. The Dutchmen have accumulated 41 tackles for loss with 12 sacks and 13 interceptions. The unit is paced by fifth-year linebacker Trevor St. Clair who tops the squad with 54 tackles, 6/5 tackles for loss, 3.5 sacks, and three interceptions. Senior safety Kevin Antol follows with 42 tackles with 4.0 tackles for loss and two forced fumbles. Sophomore linebacker Tom Gallagher also adds 42 tackles with 3.5 tackles for loss with 1.5 sacks and an interception. Sophomore linebacker Tommy Garner contributes 36 tackles with 6.0 tackles for loss while Reid Pavlik chips in with 35 tackles. King's will close out the 2015 season when the Monarchs host cross-town rival Wilkes University in the 20th annual Mayor's Cup Game at 12:00 noon at McCarthy Stadium.